Bone Plastic (osteoplasty) – Dental Clinic "FREEDENTS"
Osteoplasty or bone plastic in dentistry. What is it and why do we need bone plastic? Bone tissue consists of a mineralized fibrous matrix that includes bone cells and water. Bone tissue-an important source of calcium, it is a constituent element of the system, which regulates the constancy of calcium in the blood. Bone-plastic surgeries in dentistry-a complex of manipulations aimed at increasing the lost Volumes bone tissue of the jaw. And the loss of bone, i.e. its atrophy, serves as a direct indication of the operation. In principle, bone plastic in dental practice is performed quite often, but a little less than implantation of teeth. Why do you need bone plastic? The alveolar sprout retains its anatomical shape and size as long as it contains the roots of the teeth. After removing the teeth (due to inflammatory processes), it atrophy, and becomes smaller both in width and height. 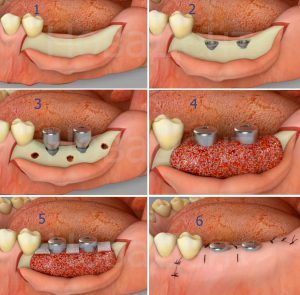 In order to fill the missing volume of bone before the implantation of the teeth carry bone plastic, because the lack of bone tissue-a reliable fixation and good survival of the implant is excluded! In fact, there is a lack of bone in many patients, but bone plastic is mainly used before implantation of teeth, because the main task of the alveolar bone of the jaw is to hold the roots of teeth in the jaw, than in the future and serve Implants. What could be the bone atrophy? Prolonged absence of teeth or inflammatory processes (periodontitis, periodontitis, etc.) in those parts of the jaw, where implantation is planned, contribute to the reduction of volumes bone tissue, the bone “goes both in width and height” and then the installation Implant becomes impossible, because for good fixation and stability of the implant requires sufficient amount of bone tissue, i.e. The implant (artificial root) must be fully surrounded by bone. How much is the implantation performed directly? It depends on many factors, on the type and quantity of the substituted and restored bone tissue. But if there was a slight increase in the width of the jaw bone, implantation can be carried out simultaneously with bone plastic. What types of bone-plastic surgeries? * Autotransplantation is when you transplant your own bone or bone blocks of the patient in case you need to enlarge the jaw in width. * The use of barrier membranes in the fixation of transplanted bone blocks, which later serve as the “outer part” of the bone. * Sinus-Lifting is an operation on raising the bottom of the sinusitis sinus and creating the missing volume, respectively, increasing the bone in height. * Alternative method of tissue regeneration-a method of bone augmentation with the use of synthetic consumable biomaterials, which replenish the lost volume and does not require the collection of the patient’s own tissue. In our dental Center the bone-plastic surgery is performed by our chief physician, Malovik Nikolai Anatolyevich, who studied these methods both in Ukraine and in Europe, constantly improving and specializing in this direction. If you are shown this operation and/or you are in search of a good specialist in this direction, come to a consultation at the dental Center “freedents_dentistry”, and you will be satisfied!